This slow-cooked Marrakesh dish is traditionally prepared in a clay pot called a tangia. Rather than cook the meat at home, the tangia would be brought to an oven adjacent to a hammam, where it would slow-cook in the ashes from the fire used to heat the bathhouse. Because ​tangia was popular among men, particularly unmarried workers, it's sometimes referred to as "bachelor's stew." It's also served as a family dish or restaurant offering. If you don't have a tangia, you can recreate the dish using another oven-proof clay pot, a Dutch oven, or a deep casserole. Stovetop directions are also below. Also, try chicken tangia with green olives and tangia meknassi with pearl onions. Or, if you enjoy variety meat, you might like tangia with calves or lamb feet. Mix the meat with the onion, garlic, parsley or cilantro, spices and chopped preserved lemon rind. Transfer the seasoned meat mixture to the tangia (or another deep oven-proof cooking dish). Add the olive oil, smen (if using), preserved lemon wedges and water. Cover the top of the tangia with a circle of parchment paper (it should be cut a little larger than the diameter of the opening). Cover the parchment paper with a layer of aluminum foil, wrapping and sealing the foil snugly to the tangia. Pierce the foil and parchment paper in two or three places with a fork. Place the tangia in a cold oven, set the thermostat to 275 F (140 C), and turn the oven on. Leave the tangia for 5 to 6 hours, at which time you can check to see if the meat is adequately cooked. It should fall off the bone and be buttery-tender. 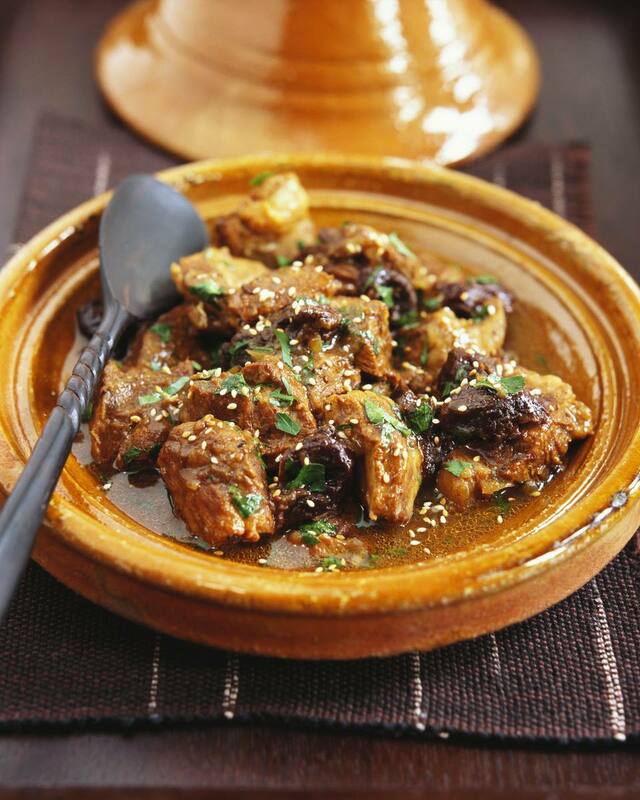 Serve the tangia on a large communal platter with Moroccan bread (khobz) for scooping up the meat and sauce. Tip: If your tangia is too tall for your oven, lay it on its side on an angle, with the top propped up on a piece of bakeware, such as an inverted loaf pan. You can also cook tangia stove top in a heavy-bottomed pot or pressure cooker. Increase the water to 2 1/2 cups and simmer for 2 1/2 to 3 hours (watch the water level) or pressure cook for 1 hour, until the meat breaks apart easily with your fingers. Reduce the sauce until thick and serve.